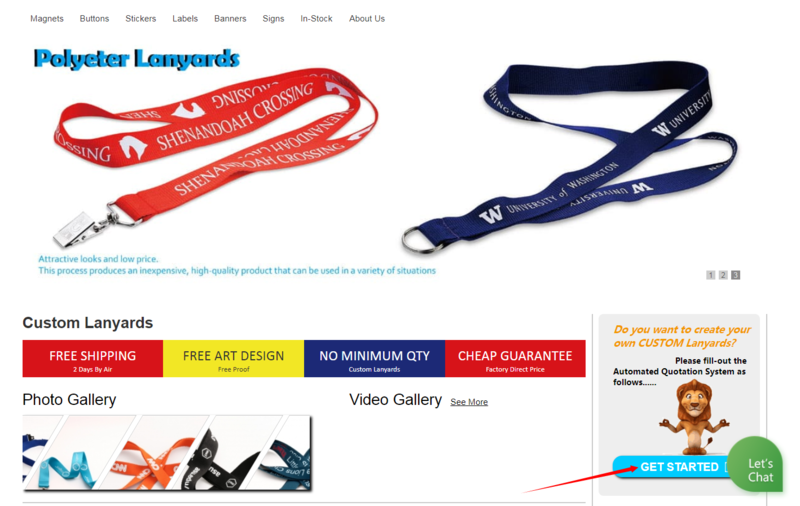 Are you puzzled about the system of customize lanyards when you entered in the lanyards page of the website GS-JJ.com? In order to give all of the customers the best customize experience, we have collected many questions and suggestions about our website page from my customer. And then we will further to optimize the webpage and give you the best solutions. We find that many customer are not proficient in using the customize system, which can cause inconvenience in the process of purchasing lanyards. This article aims to provide the detailed introduction for the customize system and teach you the steps for using it. Opening the lanyards web page of GS-JJ.com. The website URL is https://www.gs-jj.com/lanyards/Custom-Lanyards. The dynamic tiger logo will appear in front of you. Clicking on below button of “GET STARTED”, which is the entrance of the customize system. You will see three lanyards styles and their introductions. First one is Dye-sublimated Lanyards. This lanyard uses the dye-sublimated technology that can print all different colorful pictures. Dye-sublimated Lanyards can become your choice if you have many colorful pictures need to print on. The second one is Polyester Lanyards. This lanyard’s outstanding advantage is the attractive look and lowest price. If you were on a tight budget lately, you can choose the Polyester Lanyards. Of course, you also can print all colors’ logo and words on it. The third one is Woven Lanyards. This lanyard was made by strong polyester material and it has single or multiple colored texts woven by thread. If you are a person who has high quality design imprint requirements, you can choose Woven Lanyards. 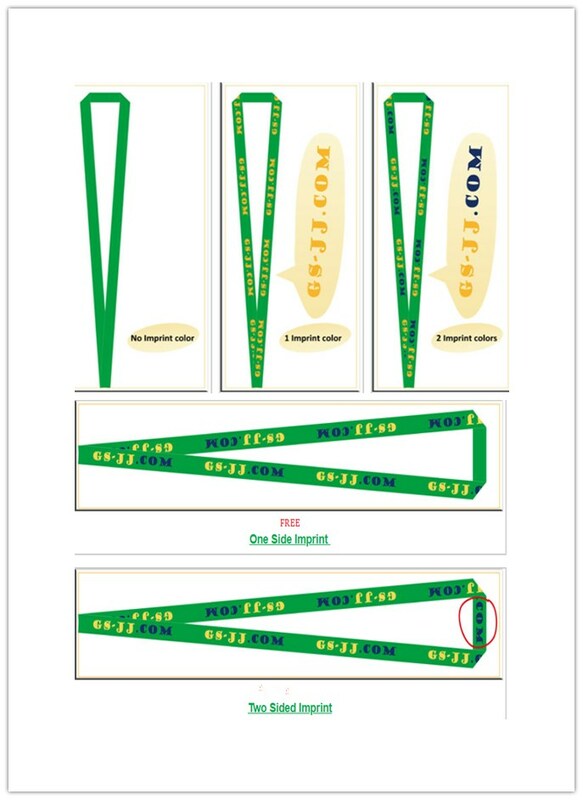 After choosing the lanyards style, you should choose the size for your customize lanyards. 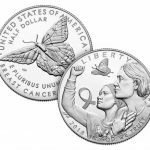 The size included two dimensions (width and length). The normal lengths of lanyards were 36 inches. One inch is equal to 2.54 centimeters, so 36 inches were equal to 91.44 centimeters. The width included 1/2 inch, 5/8 inch, 3/4 inch and 1 inch. You should know that the 3/4″ width and 36″ length is the most popular size and the suitable for public. If you make lanyards for your company or organization, you can choose the most popular size. If you make it for a big celebration or meeting, you can choose the wider size like 1″ width. The 1/2″ width lanyards can be used and worn on the middle school students. We have added a picture about the size of lanyards below. Actually, if you have individual requirements for the size, contact us and we will make it for you. The step of choosing color is a free and comprehensive. You can choose any colors you like as a background color. On the system, we only have shown sixteen colors with sixteen PMS color numbers. If you like one of them, you need to write the number in the comments. If you choose Woven Lanyards or Polyester Lanyards, the sixteen colors showed on the system are free. But other colors that have not shown on the system should add extra charge. If you buy the polyester lanyards, you will experience this step for imprint. We provide one imprint color and two imprint colors. This selection depends on your hobby, if you want to make the lanyards more attractive and beauty, you can design by yourself. Of course, you can choose no imprint color. In addition to above, you also need to choose one sided imprint or two sided imprint. One sided imprint can make the single custom lanyards simple and refreshing. The attachment is the most important section on customize lanyards. 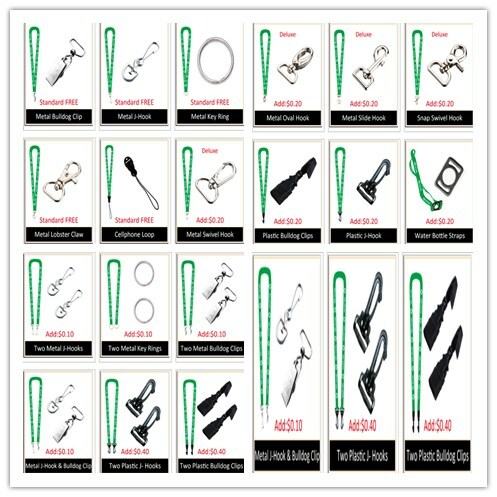 In our customize lanyards, we have prepared twenty one attachments for you. Twelve of them are single attachment; nine of them are composite attachment. The most common used attachments are bulldog clip, J-Hook, key ring and lobster claw. You also can choose the material for attachment, like metal or plastic. Do you like the customize lanyards with two attachments? The two attachments can be chose and match by our own. The safety breakaway only has five types. Both of custom breakaway lanyards can protect you when you afford a large pressure. Especially for the child or students, this is the best choice for them. If you want to know more detail about attachment and safety breakaway, you can click here! As you have seen on the system, we can offer the badge holder. If you purchase the customize lanyards for your company or school. You should distribute the holder to the staff for putting their cards. We have all different size badge holder. Both of them were inhibited on GS-JJ.com. 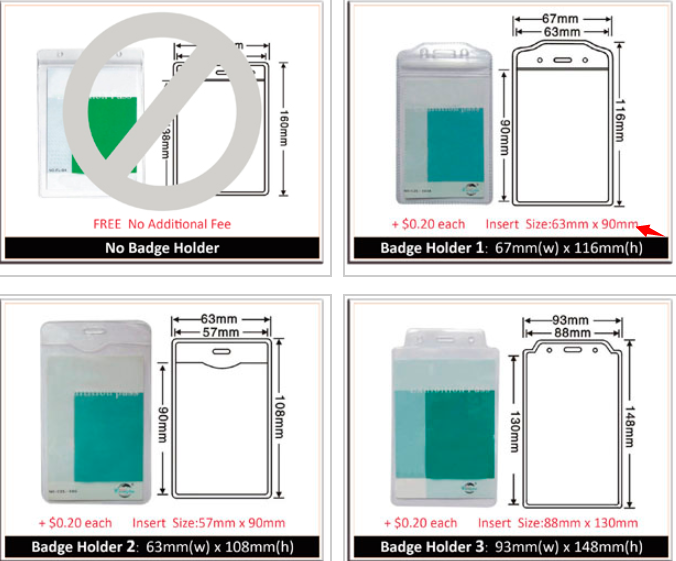 According to the size of badge holder, we also give you the insert size of the work card. It can provide convenience for making work card. The standard package is 50 or 100 pcs per bag. The lanyard belongs to small items. For this reason, we mainly sell it in the form of wholesale. If the quantity of the wholesale lanyards is less than 50 pcs, you can contact with us by email. We can further to discuss it. The individual polybag also provided, but you should add the price. After confirming above steps, you should communicate with the designers to confirm the first drawing. If you have some special ideals, tell them and ask their suggestions. When you and your designer come to an agreement, it means that the custom made lanyards were finished soon after. According to the introduction of the system of customize lanyards, you will use it fluently. Hope you will have the best purchase experience on GS-JJ. Our company has inhibited all kinds of lanyards we designed from the past to the present. You can find the best lanyards you like.